The Jewish Federation of Ottawa (JFO) raised more than $220,000 for charity this week at their 25th Annual Golf Tournament, with The Foundation (WCPD) proud to serve as a Silver Sponsor. 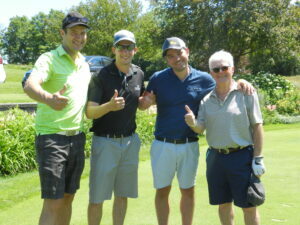 The event attracted more than 140 golfers and many business leaders from across Ottawa. Held at the beautiful Rideau View Golf Club, the JFO’s annual tournament is known as one of the best of its kind in the nation’s capital. It is this sharp attention to detail that has inspired so many sponsors to give generously. The annual golf tournament raises funds for programs and agencies in Ottawa such as Tamir, which assists people with developmental disabilities, the Bess and Moe Greenberg Family Hillel Lodge long-term care facility, which is a home for the aged, and Jewish Family Services, a social service agency supporting the entire city. From left: Bruce Raganold, Director of Business Development at Welch LLP, Chris Richards, Financial Administrator at The Foundation (WCPD), Jeff Todd, Director of Communications at The Foundation (WCPD), and Len Farber, Senior Tax Advisor at Norton Rose Fulbright. In the last 25 years, the tournament has raised more than $3.5 million. 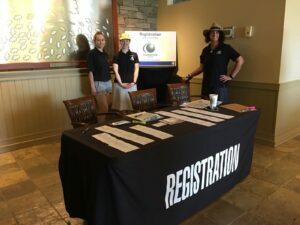 For The Foundation’s part, it was proud to sponsor the registration booth as golfers first arrived at the course. To learn more about the Jewish Federation of Ottawa, click here.